Affectionately known as "The Actors' Church", St Paul's in Covent Garden is in the heart of theatreland and has long been associated with the theatre community. This beautiful church, built by Inigo Jones, has been here since 1633 and has regular worship, concerts, literary and theatrical events. Many famous names have been connected with St Paul's - John Wesley preached here, J.M.W Turner and W.S Gilbert were baptised here, and those buried here include Sir Peter Lely, Samuel Butler, William Wycherly, Grinling Gibbons, Thomas Arne, and Thomas Rowlandson. One of many plaques in the church commemorating legends of the stage and screen is one in loving memory of Vivien Leigh. The church's history and philosophy is endearingly written by the church doors and includes the principles: we are unafraid to reason, laugh and explore and we welcome people of faith, all who seek faith and friendship, and all who doubt. 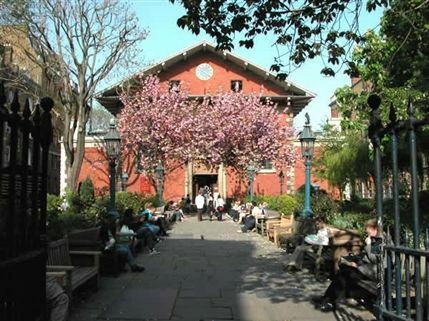 Benches in the attractive churchyard make this a popular and peaceful spot for Soho's workers to enjoy a sandwich during a summer lunch break. It's a welcome refuge of peace and quiet away from the busy streets around Covent Garden. The actors' church welcomes Punch and Judy professors and puppeteers from around the UK. What are the best dining options near St Paul's Church, Covent Garden London? St Paul's Church, Covent Garden gyms, sporting activities, health & beauty and fitness. The best pubs near London St Paul's Church, Covent Garden. St Paul's Church, Covent Garden clubs, bars, cabaret nights, casinos and interesting nightlife. Where to have your meeting, conference, exhibition, private dining or training course near St Paul's Church, Covent Garden. From cheap budget hotels to luxury 5 star suites see our special offers for St Paul's Church, Covent Garden hotels, including Strand Palace Hotel London from 85% off.